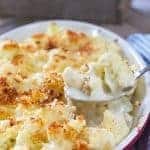 Creamy Cauliflower Au Gratin – How much flavor can you stuff into a vegetable? This big flavored casserole will have everyone scraping their plates! Misbehavin’ veggies! 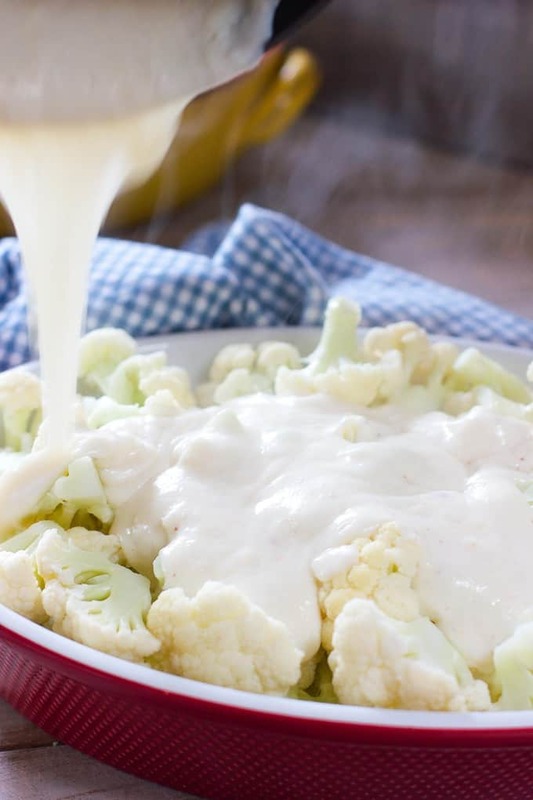 Cauliflower all mixed up with a super easy and creamy cheese sauce! This recipe was lovingly borrowed from Ina Garten. She cooks the way I love to cook, which is simple and fresh. I increased the sauce and the amount of veggies to make a bigger casserole. You can never have enough sauce and I wanted this to feed at least 6-8 people as a side dish. You can stretch this to 10 people depending on how many other dishes you serve. Would pair great with a baked ham or a roast chicken! 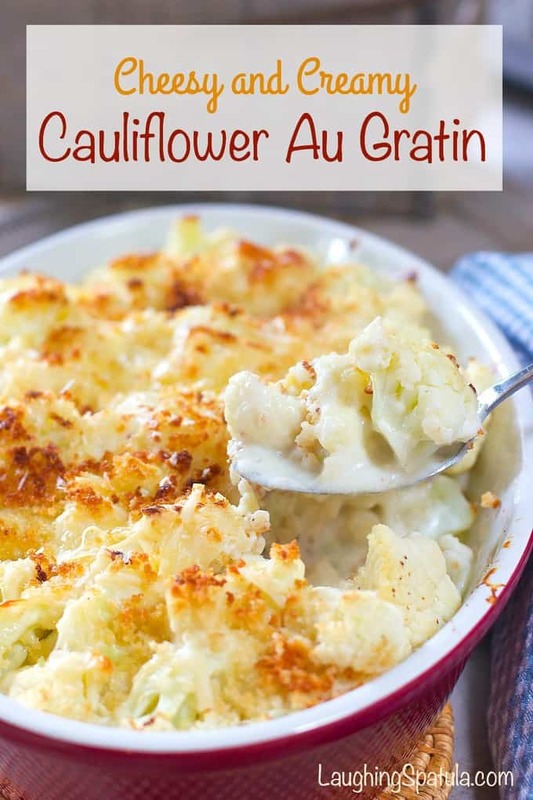 How I made this Creamy Cauliflower Au Gratins Casserole! Par cook your veggies in the microwave. I love this steamer basket. Or boil the cauliflower for 5 minutes until just fork tender. Now dump those veggies on top of the sauce and pour your remaining cheese sauce over the top. I used gruyere cheese but a cheddar cheese would be good. 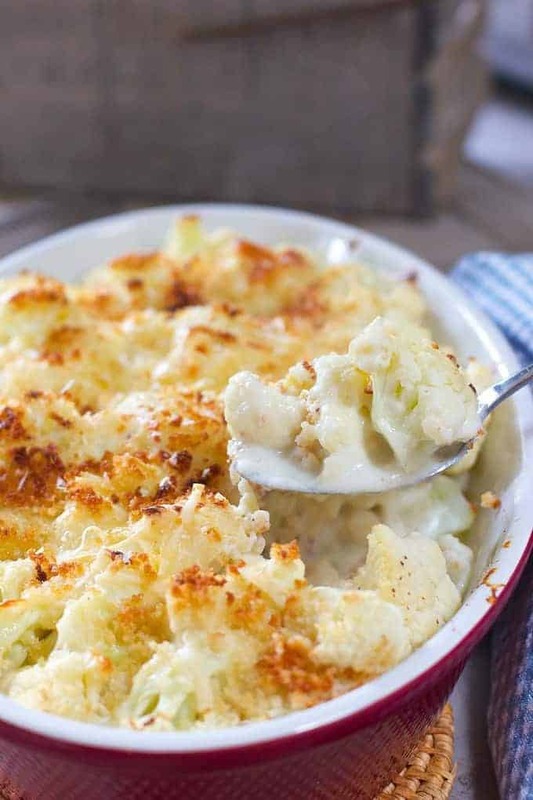 Think cauli mac and cheese without the mac! Top with more cheese and bread crumbs. Bake for about 40 minutes and you have a cheesy wonderful dish. Now, all you have to do is pat yourself on the back for eating all your veggies! This dish is perfect for the holidays! Easter, Christmas, Friday Night? You can see all our side dishes here , but below are my two of our faves! Cauliflower Rice with Mushrooms and Feta! 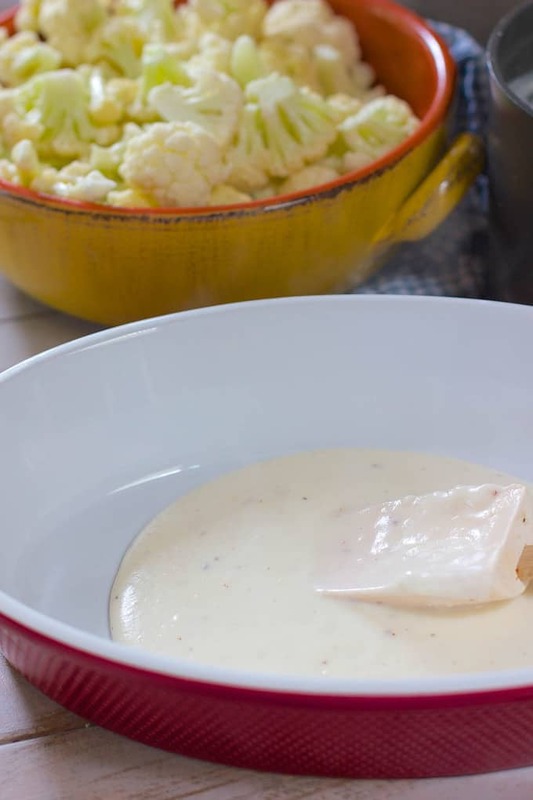 Fresh cauliflower mixed up with an easy to make cream sauce and topped with Gruyere cheese! 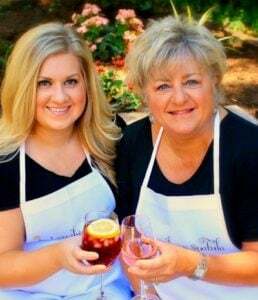 Perfect compliment to all your meals and wonderful for any Holiday side dish! Separate cauliflower into florets and either steam for 5 minutes or boil in large pot of water for 5 minutes, until just barely tender. Drain and set aside. In sauce pan, melt 4 tablespoons of butter. Add 1/3 cup of flour and whisk until smooth and mixture is bubbling. Add milk and continue to stir until thick. Add one cup of gruyere cheese and stir until melted. Sauce should cover the back of a spoon. Pour 1/3 of the sauce into 9 x 13 casserole or au gratin dish. Place par cooked cauliflower on top. Sprinkle with salt. Pour remaining sauce onto of cauliflower. For Topping - combine melted butter, gruyere and bread crumbs in small bowl. Sprinkle on top of cauliflower. 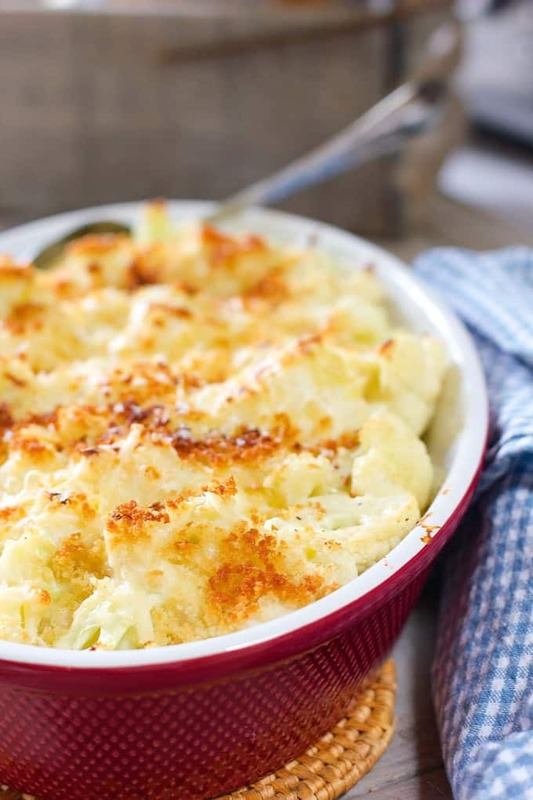 Bake for 30 minutes or until top is crispy and cauliflower is tender. Tried this recipe tonight. EXCELLENT flavor and texture. My local store didn’t have gruyere cheese so I used a good quality sharp cheddar cheese. Also, I’m only cooking for one so I only used approximately 1/2 on the measurements. I wanted to give it a trial run as I was thinking about using it for Christmas dinner. Love this recipe. Do you add the one cup of cheese to the white sauce? Hi Vera – yes, add one cup of gruyere to the white sauce. Thanks for your note, I needed to make that more clear and have updated the recipe! I love Ina too! Crazy how popular cauliflower has become lately! This looks absolutely amazing and will go perfectly with my brunch menu next weekend! Thanks for sharing. Pinned! Thank you for the nice note Susan!